The sad mystery of the two little princes in the Tower have intrigued historians for hundreds of years. The two little princes were Edward V and his younger brother Richard, Duke of York. Edward V was the eldest son of King Edward IV and Elizabeth Woodville. He was born in 1470 and ascended the throne when his father died in 9th April 1483. But he reigned for only two months before disappearing from the Tower of London. Because he was only thirteen years old, and a minor, his uncle Richard, Duke of Gloucester, was entrusted as Protector of his young nephews. Richard had always been a loyal and trusted supporter of his brother King Edward IV, who was the boys father. The coronation of the young prince was set for 22nd June 1483. As tradition dictated the coronation procession would take place from the Tower of London, through the City of London to Westminster Abbey. The 12-year-old prince was staying at Ludlow Castle when the news came of his father's sudden death and the young prince became King Edward V. The young prince started the journey from Ludlow to the Tower of London for his coronation. Who was Richard, Duke of York? Richard of Shrewsbury, 1st Duke of York, was the second son of King Edward IV and Elizabeth Woodville. He was born in 1473 and the younger brother of Edward V. He also headed for the royal apartments in the Tower of London to prepare for the coronation ceremony of his brother. Elizabeth Woodville, their mother, was an ambitious woman, disliked by many. After the death of King Edward IV strong doubts were cast on the legitimacy of the two little princes by Robert Stillington, the Bishop of Bath and Wells, Lord Chancellor of England. Stillington presented evidence that King Edward IV had contracted a secret marriage to Lady Eleanor Talbot in 1461 who was still alive when he married Elizabeth Woodville in 1464. Lady Eleanor Talbot died in a convent in June 1468. The marriage between Edward IV and Elizabeth Woodville was declared a clear case of bigamy, which invalidated their marriage, making their children illegitimate. Edward left seven living children - the two princes and five daughters. King Edward IV was a real womaniser, so the affair with Lady Eleanor Talbot was no doubt true. His most famous liaison was with a Goldsmith's wife, the great beauty Jane Shore. Jane Shore was first the mistress of Lord Hastings and then the King. After the death of King Edward IV Jane Shore was accused of Sorcery and imprisoned in the Tower of London on the orders of Richard III. She was forced to do penance as a harlot. The two little princes had no idea that anything was wrong. They trusted their uncle and Protector Richard of Gloucester and were awaiting the coronation fixed for the 22nd June 1483. Their father had only recently died in April of the same year. Their world was collapsing around them. First with the death of their father and then their uncle Gloucester intercepted Edward’s entourage as it travelled to London. Many of the young king’s supporters were killed and William Hastings was arrested on a charge of treason and imprisoned in the Tower. Edward was escorted to London and then to the Tower. On the 16th June 1483 he was joined by his brother Prince Richard. The coronation was cancelled. On June 25 1483, Parliament declared the two little princes illegitimate and, as next in line to the throne, their uncle and Protector, Richard, Duke of Gloucester, was declared the true King. The two little princes were never seen again. Richard, Duke of Gloucester was crowned King Richard III on 6 July 1483. A Lancastrian rebellion rose against the Yorkist Richard and on August 22nd 1485 he fell in the Battle of Bosworth Field to Henry Tudor. Henry Tudor later became King Henry VII. Henry Tudor cemented his succession and settled the friction between the Yorkists and Lancastrians by marrying the Yorkist heir, Elizabeth of York. They started the Tudor dynasty and were the parents of King Henry VIII. But the mystery of the two little princes in the Tower haunted the Tudors. The disappearance of the two little princes in the Tower led to many rumours that at least one of the princes had survived - the younger Prince Richard, Duke of York. Two 'Pretenders' emerged. Lambert Simnell and the more credible Perkin Warbeck both claimed to be one of the Plantagenet Princes threatening the Tudor claim to the throne. King Henry VII, King Henry VIII and even Queen Elizabeth I needed to tie up the loose ends left by the mysterious disappearance of the princes. Sir Thomas More was the first to claim, in The History of King Richard III, that the princes were smothered with the pillows on their beds by Sir James Tyrell, John Dighton and Miles Forest. Tyrell is reported to have confessed to the crime whilst imprisoned in the Tower of London in 1502. But the confessed murderer of two royal princes was never executed for this crime! Sir James Tyrell was attainted in 1504 for the lesser crime of associating with Edmund de la Pole. William Shakespeare encouraged belief in the Thomas More story with his plays in which Richard III was branded a deformed evil monster. In 1674 two skeletons were discovered in the White Tower under the stairs leading to the chapel. The skeletons were subsequently reburied in Westminster Abbey as ordered by King Charles II. 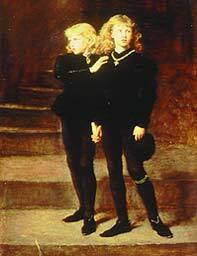 The skeletons were believed to be the remains of the bodies of the two tragic Little Princes, Edward V and his younger brother Richard, Duke of York. The two little Princes were reputedly killed on the orders of their uncle the Duke of Gloucester, afterwards King Richard III.